The Swanage Railway will be hosting two big events in the next couple of months, namely their steam gala from Friday, 17 April to Sunday, 19 April, 2015 and their Diesel Gala from Friday 8 to Sunday 10 May, 2015. Both events are shaping up nicely. History is to be made on the Swanage Railway with the first ever visit of a classic and powerful 1930s ‘Schools’ class main line express steam locomotive – when No. 925 ‘Cheltenham’ stars in the heritage line’s popular Spring Steam Gala. The three-day event will see the magnificent locomotive – part of the National Railway Museum’s prestigious National Collection – haul passenger trains between Norden Park & Ride, Corfe Castle, Harman’s Cross and Swanage from Friday, 17 April to Sunday, 19 April, 2015 (inclusive). Swanage Railway Acting General Manager Matt Green said: “Everyone is delighted and very excited at the prospect of the first ever ‘Schools’ class express steam locomotive hauling passenger trains on the Swanage Railway. “It will be an historic and memorable first because while the powerful and majestic locomotives never hauled trains on the branch line from Wareham to Corfe Castle and Swanage, they did head fast express trains through Wareham on the London to Bournemouth and Weymouth main line. “The ‘Schools’ class was not just the last steam locomotive in Britain to be designed with a 4-4-0 wheel arrangement, it was also the most powerful class of 4-4-0 ever produced in Europe which is quite something,” he added. The ‘Schools’ class was frequently regarded by locomotive crews as the finest constructed by the Southern Railway up to 1930 and could turn in highly spectacular performances for its size. The fastest recorded speed for a ‘Schools’ class locomotive was 95 mph which was achieved near Wool railway station in Dorset during 1938 by No. 928 ‘Stowe’ hauling a four-coach train from Dorchester to Wareham. Weighing 109 tons and carrying five tons of coal and 4,000 gallons of water, the three-cylinder No. 925 ‘Cheltenham’ was built at Eastleigh Works in Hampshire during 1934. After being based at Fratton in Hampshire, Kent and at Nine Elms in London, the locomotive was withdrawn from traffic at Basingstoke during 1962. ‘Cheltenham’ was saved from the scrapyard by the National Railway Museum and preserved for the nation because it appeared as the mascot on the cover of the Railway Correspondence and Travel Society (RCTS) magazine. No. 925 was used to haul many RCTS rail tours, including on ‘foreign’ lines such as the Great Central and the East Coast Main Line where it touched 80 mph. Designed by Richard Maunsell, the Chief Mechanical Engineer of the Southern Railway Company, for hauling both passenger and freight trains, the 40 ‘Schools’ class locomotives were all built at Eastleigh between 1930 and 1935 – being named after public schools around the country. Originally built for hauling trains in south-east England, the popularity, power and efficiency of the ‘Schools’ locomotives saw them used in the south of England and even south-west England. No. 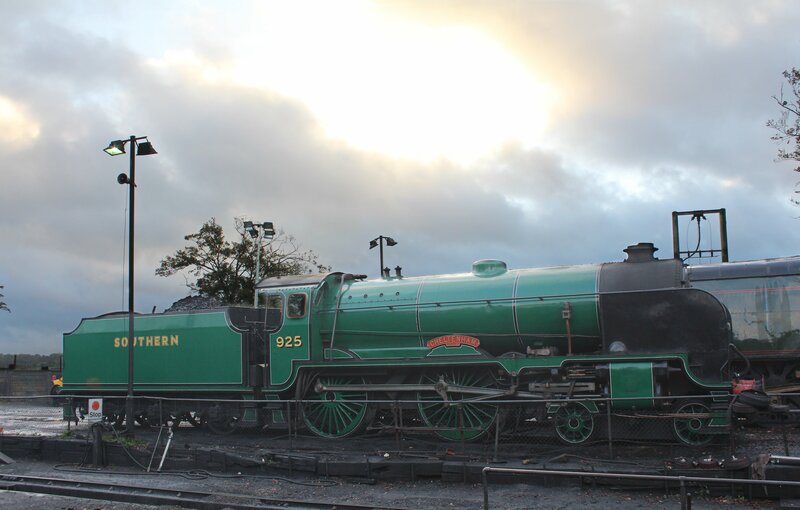 925 ‘Cheltenham’ is based on the Mid-Hants Railway in Hampshire which is responsible for the locomotive’s care and maintenance on behalf of the National Railway Museum in York. ‘Cheltenham’ was restored to full working order by a team from the Mid-Hants Railway between 2010 and 2012 at Eastleigh Works in Hampshire – the very place where it was built during 1934. Swanage Railway train times – and special event details – are available online at www.swanagerailway.co.uk or by telephone on 01929 425800. Diesel-hauled trains on British Rail’s former Western Region will be re-created during an evocative ‘Go West’ preview day ahead of this year’s exciting three-day Diesel Gala and Dorset Beer Festival. Thursday 7 May, 2015, will see Class 45 No. 45060 ‘Sherwood Forrester’ and Class 50 No. 50035 ‘Ark Royal’ operating between Norden park & ride, Corfe Castle, Harman’s Cross and Swanage alongside steam-hauled trains. 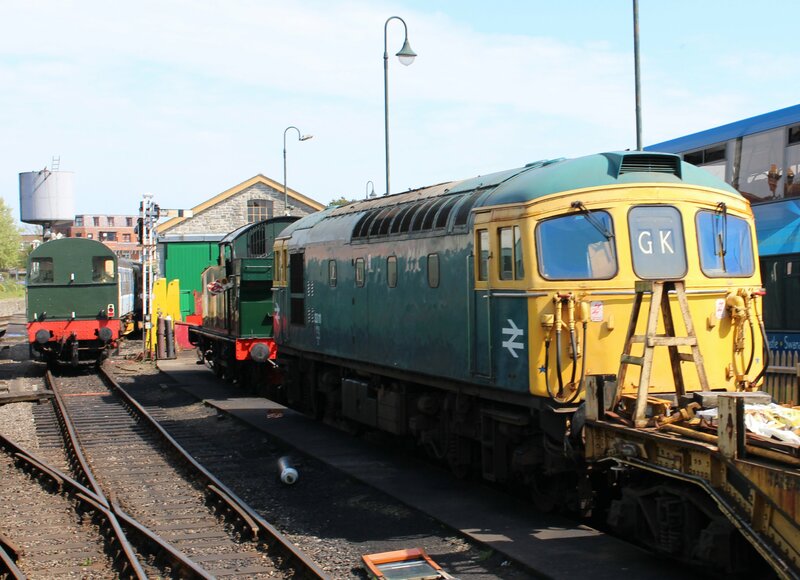 The Diesel Gala and Dorset Beer Festival runs from Friday 8 to Sunday 10 May, 2015, inclusive, and will see an intensive three-train service operate between Norden park & ride and Swanage from 8am to 12 midnight on the Friday and Saturday and from 8am to 7pm on the Sunday. Class 37 – No. 37 057. Class 45 – No. 45 060 ‘Sherwood Forrester’. Class 50 – No. 50 035 ‘Ark Royal’. Class 56 – No. 56 006. Class 66 – courtesy of GB Railfreight. Subject to availability, the Swanage Railway’s Southern Region Class 33 diesel locomotives also will be appearing – No. 33111 and No. 33201 both in their 1970s British Rail blue liveries. The action-packed weekend will also see the first Swanage Railway passenger trains operate over the newly-acquired three-mile section of track from Motala (a mile west of Norden station) to the Network Rail border near Worgret Junction. The Beer Festival will take place at Corfe Castle station where popular Swanage Railway ales ‘Old Pusher’, ‘Regulator’ and new brew ‘Swanage Pride’ will be on sale. Other attractions include the fascinating goods shed museum, exhibition and coach as well as trade and enthusiast stands at Corfe Castle and Swanage stations. ‘Beerex’ and Wessex Belle ‘Bistro’ dining train services will also be operating on the Friday and Saturday evenings. Advance booking for the Bistro trains is essential. On the Friday, No. 37057 will be hauling the ‘Beerex’ train with No. 45060 working the Wessex Belle ‘Bistro’. On the Saturday evening No. D5185 and No. 33201 will haul the ‘Beerex’ while No. 50035 will be working the Wessex Belle ‘Bistro’. On the ‘Go West’ preview day on the Thursday, there will be Freedom of the Line fares for all-day travel available at £12.50 for adults, £7.50 for children and £35 for families (two adults and up to three children aged three to 15 inclusive). Diesel gala Adult Rover fares for unlimited travel are £25 for a one day Rover, £38 for two days or £46 for three days. Discounted fares are available for children. Adult Rover fares for ‘Priv’ card holders and CAMRA members are £18 for one day, £28 for two days and £36 for three days. Standard single and return fares are also available. 21/03/2015 in News - Preserved Railway, Swanage Railway.